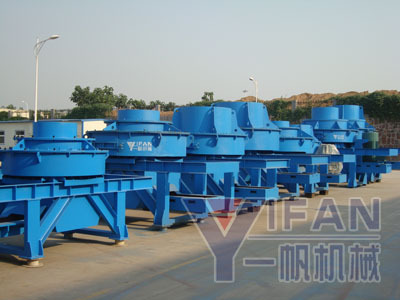 VI Series Vertical Shaft Impact Crushers have another name called Sand Maker, which is high-performance equipment for sand making and shaping, is researched and produced by our corporation through absorbing the advanced technology from Germany, and has achieved world advanced standards. This equipment has two types: rock-on-rock and rock-on-iron. Sand yield of “rock-on-iron” type is higher by 10-20% than that of “rock-on-rock” type. Sand maker is widely used in fine crushing and rough grinding of metal, mineral, building aggregate, concrete, anti-fire material, glass raw material, manufactured sand and all kinds of metallurgical residue. It is also can utilized in shaping of high rank road surface. Sand maker is widely used in manufactured sand producing of river gravel, mineral and stone ships ect. Sand maker is used for producing glass raw material and quartz sand ect.